Lichens are everywhere, yet most people fail to notice them because they are so familiar. 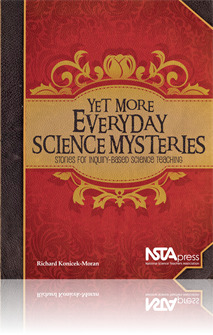 The story in this chapter was written to help persuade teachers to acquaint their students with these unique forms of life. Many biology teachers tend to gloss over the study of lichens and many of the other simple plants, even though lichens are universally available in virtually every environment, including urban centers. The author hopes that this story will help more students appreciate and become interested in lichens. This free selection also includes the Table of Contents, Preface, Introduction, and Index. Looking at Lichens takes an organism that is available in nature and has students posing questions. Information is provided to help teachers integrate the story with their curriculum. I also like that that author provides tips on how to write your own stories or to have students write stories.